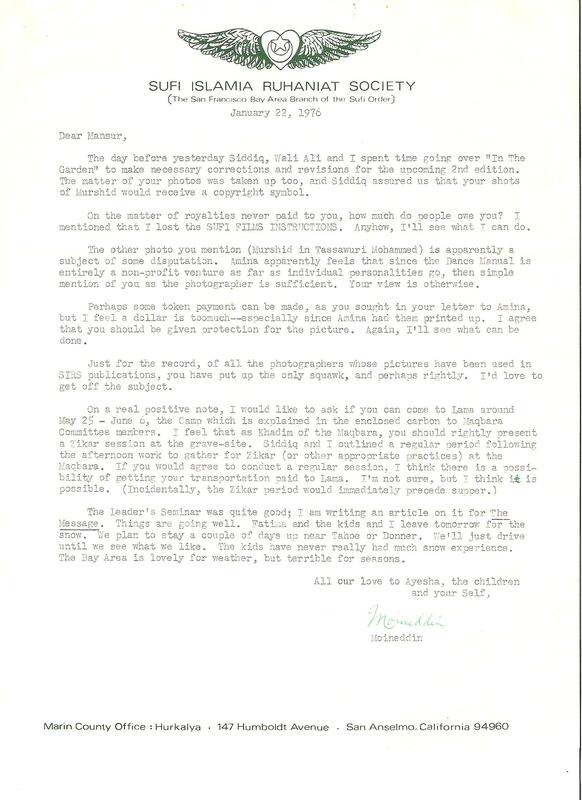 The next letter is dated January 12, 1976. Like Jayanara Herz, wife of Hassan Herz mentioned earlier, who has to be constantly vigilant lest someone misuse her father’s creation of the song, Rudolph, the Red Nosed Reindeer, Mansur in this letter introduces a similar theme. Mansur has to be constantly vigilant lest someone misuse, or put into the public domain, or somehow leave open the unauthorized usage of his Murshid photos. All eight paragraphs concern this. Mansur addressed Moineddin about this, because someone in SIRS accepted the responsibility of marketing Mansur's photos of Murshid. Surya is speaking for Lama Foundation in New Mexico, which is preparing a book called In the Garden about Murshid. Graciously, Moineddin painstakingly recovers and quotes from old letters relating to this matter. The invitation in paragraph 5 for Lama to publish Mansur’s children’s storybook with drawings about “Namla, the cat,” actually titled, “Curiosity Liberated the Cat” did not happen for reasons that escape me at this late date. To finish the story related to the lost sheet “Instructions for an agent of Sufi Film Productions,” which was the name Mansur was using for his film business, it should be noted that after several years of sales by S.I.R.S. and no royalties to Mansur, when Mansur mentioned this to Moineddin, a check for $100 was issued by Moineddin to Mansur on behalf of S.I.R.S. for unaccounted sales over that time period. Considering that the letter concludes with Moineddin not recalling Murshid speaking about the commercialization of his photos, I will include a copy of the release Murshid signed regarding the commercialization of his photos after the next letter. The release itself is a zerox copy and doesn’t scan well. Suffice it to say, permission was granted by Murshid to market his image, which is what we are doing exclusively on this website. Thanks for your letter of January 4. Going back over my correspondence to and from Surya early in 1975 I find that it was clearly stated that the color shots of Murshid were yours and should be credited to you. Without wanting to go out and have several letters Xeroxed, I will quote some lines from Surya’s letters to me at that time. The only additional pertinent stuff I can find is a P.S. you wrote to Surya on February 7, 1975: “But in the meantime, if you want me to keep working on this, send me $200, including $100 for proofsheets of Murshid pictures that I have and $100 for copies of writings, agree to pay so much for each picture that you use, and promise to give credit to MANSUR on each page where you use something I supply. The writings would include my journal [which became the book Murshid] ‘Murshid,’ The Bowl of Saki Life of Samuel L. Lewis, and the book you requested on Namla, Curiosity Liberated the Cat. I don’t believe that S.I.R.S. owns your picures at all, just the set we purchased. All the rights are yours, obviously. I don’t recall Murshid’s statements regarding permission for you to commercialize photos of him, or that pictures of him without a beard would be valuable some day—but I see no reason not to accept that he made such statements, especially if you say he did. P.S. You should write to Lama before the next edition comes out to get it all cleared up. Let me know if you want me to write to them too.